Indiahike’s vehicles—a tempo traveller and two cabs—were waiting opposite to Dehradun Railway Station. I reached there by 6:30 AM. New Delhi to Dehradun – Nanda Devi Express, on which few trekkers would be arriving, was late by an hour. This delayed our start by another hour and half. Dehradun Railway Station at 6:30 AM. The tempo traveller I was in had people from Ahmedabad, Goa, Hong Kong, Indore, Bangalore, Hyderabad, Mumbai and Calcutta. 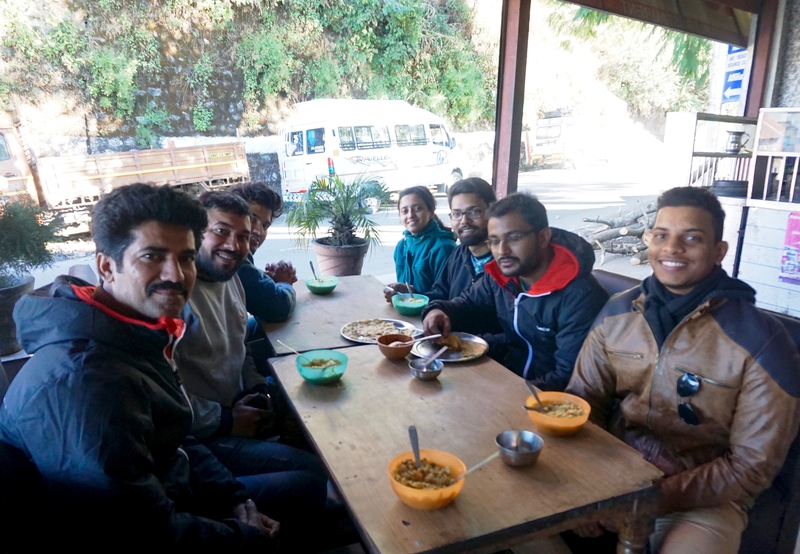 We drove towards Mussoorie and stopped at a roadside dhaba before taking the Mussoorie bypass. It was an odd time for the shop—too late for breakfast, too early for lunch. As such, they were ill prepared to handle our requests. Maggi and eggs were readily available and parathas would be delayed but could be prepared. Our group enjoying some Maggi and parathas. 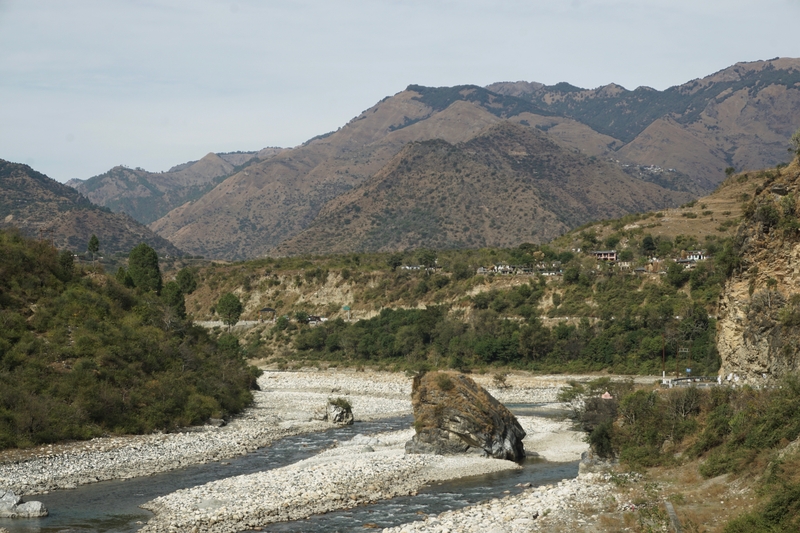 The drive past Mussoorie, all the way to Purola, was through vistas that I have come to enjoy, appreciate and familiarise myself with in the past few weeks—river on one side and hills all around, punctured by an occasional settlement and solitary temples. Barring a small rest stop, the trip was uneventful for us. Another smaller vehicle, carrying a few more of the trekkers, ran into a drainage ditch on the mountain side. Although it was harmless, some the guys inside got scared. The lady from Calcutta had taken great pains to reach Dehradun. Her train got cancelled and stopped at Lucknow yesterday afternoon. 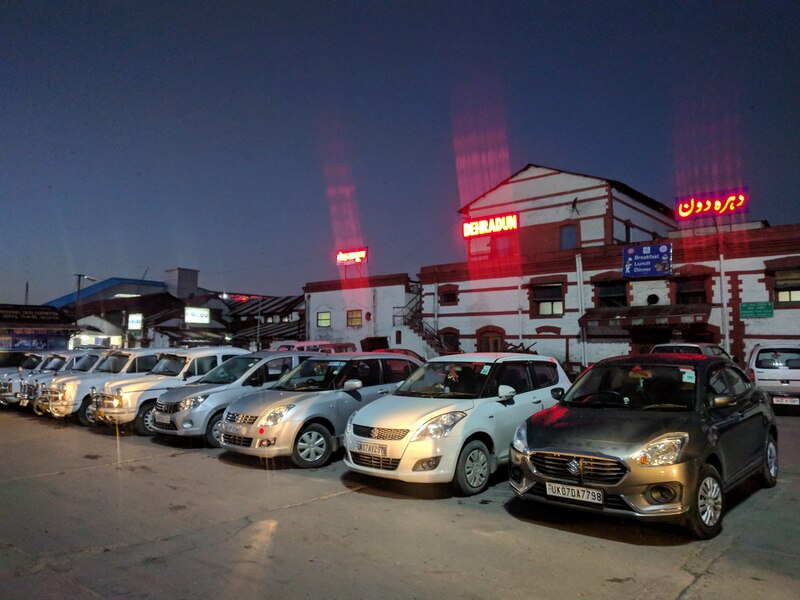 She had to travel all the way to Dehradun in a shared cab along with some other family in order to catch a vehicle to Sankri in time. She looked sleep deprived. At least, she had a story to share in her future conversations. View of the valley from the place we had stopped. It took us longer to get past our lunch point in Purola due to the the restaurant delaying some of our orders. This also meant that we would be entering Sankri well after sundown. This was also the last spot where services like photocopying was available. We had to submit an identity proof at a checkpoint on Mori-Sankri road. Someone told us about some mishap in a village on Har-ki-Dun trekking route but the details were vague. The sun was setting when we were at the checkpoint. Sankri was still twenty kilometres (and nearly one-and-a-half hour) away. Once we were at Sankri (and it was a quite late arrival), we were all gathered in a room at Hotel Swargarohini and given a bad news. 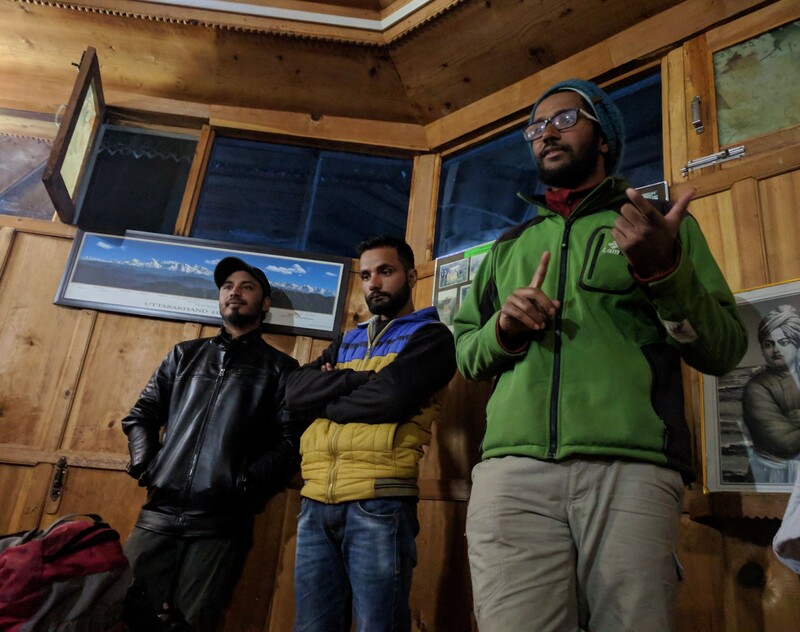 Deputy Director of Govind Pashu Vihar National Park and Sanctuary, where Har-Ki-Doon trek route was located, had issued a notice banning all treks through routes and meadows of the sanctuary. This was in the wake of three shepherds dying due to a landslide that was in turn caused by heavy snowstorm. If that was not all, the last batch to Har-Ki-Doon were stuck at Osla village for three days and were stuck in snowstorm. We were given option to switch to Kedarkantha trek instead. Some people who had done the trek before were also given the option to switch to Dayara Bugyal trek. The COO of Indiahikes drove all the way to Purola and got back with a copy of the letter while were were being given the news. 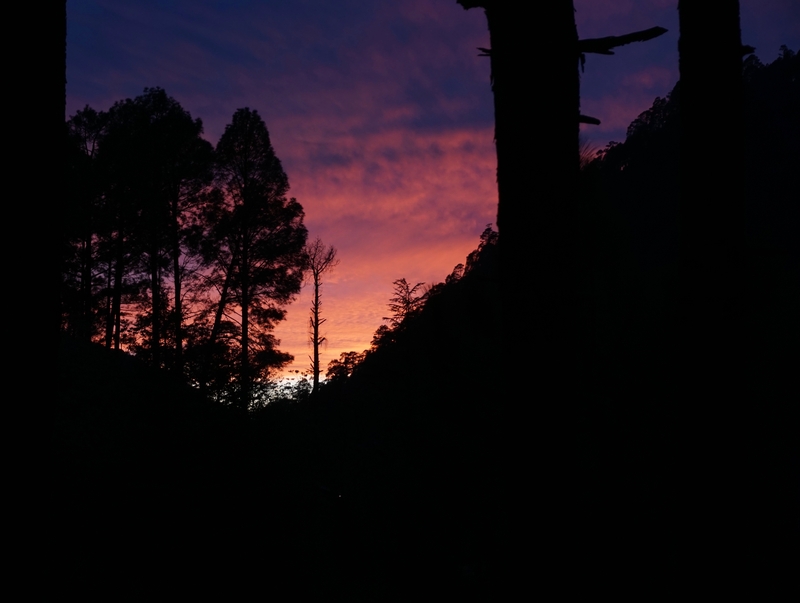 Those who opted for Kedarkantha trek would be paid back the difference. It wasn’t like Kedarkantha was exempt from the fury of nature’s wrath. The last three batches had to descend without summiting due to heavy snowfall. 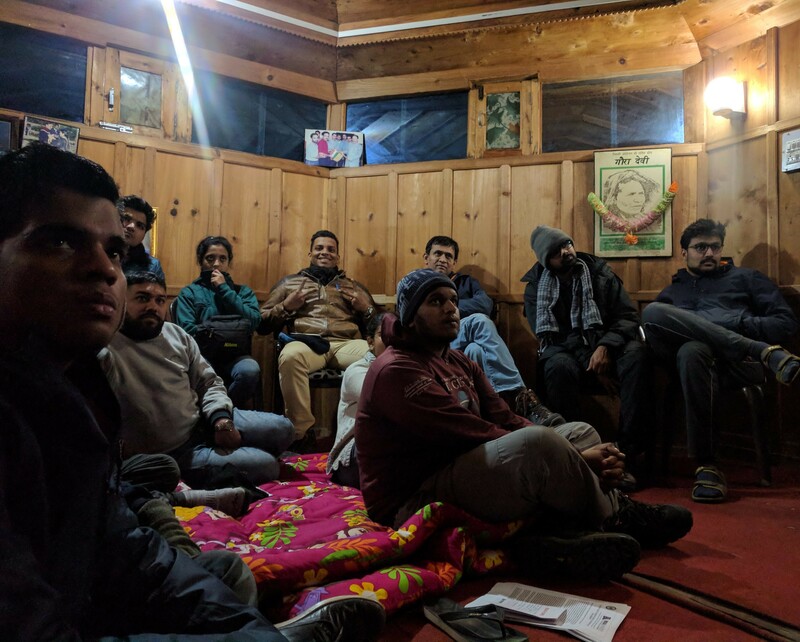 The trek leader, Karthik Maddineni, introduced us to our guide, Dev, and the co-guide, Swamiji, and instructed us on the dos and don’ts of the trek before serving us dinner. Dev and Swamij stood while Karthik briefed us about the trek. Sankri was cold. At least Hotel Swargarohini had clean and thick quilts to take care of that. For me it was all about charging myself up with a good night’s sleep and charging my devices before embarking on the trek tomorrow.